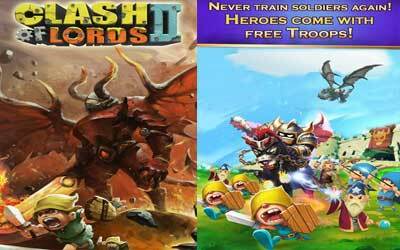 Another tower-defense strategy game appears for you, in form of Clash of Lords 2 APK 1.0.211. An innovation from the already popular strategy game, it is the evolution of a very addicting game. In this game, you will be able to choose many different characters, all with different classes and skills, to take control of the city’s defense and fight swarms of enemies. The latest touch of scenario and technology bring the battle closer to the real combat of strategy, as the changes from the previous series bring a major difference to the gameplay. For a real-time strategy game, Clash of Lords 2 tackles you against many opponents. You will take control of the city’s defense in order to protect it against the enemies and use it to fight as well. During the building of the defense system, you will choose the hero that will defend it. Many configurations to the defense system enable you to fight and defend against the opponents in your own way. As you play the hero to defend the city, you will take control of the flow of the battle. The skills of your hero can finally be used and controlled directly in order to eradicate the opponents and add more challenge to the game. Such new feature brings more intense gaming experience, and there are definitely more to come. Clash of Lords 2 gives you tons of upgrades, and they’re all yours to use. Many new heroes can be chosen for your city’s defense, all with different supplies and skills that can change the tide of battle. The newest PvP arena will tackles you against many different foes in Hero Trials. For an extra fun, you can play it with your friends in the Guild system in order to stand with/against your friends. The intense struggle to defend your area will be unleashed in Clash of Lords 2 for Android. You control the action! Activate Heroes’ battle skills in real time! Pair Heroes and Troops in the all-new Mercenary mode! Play Your Way! With nine PvE and PvP modes, there’s always something fun to do! Fight with your friends! A robust Guild system lets you battle alongside (or against!) your allies! Free to Play! Log in to Clash of Lords 2 every day for free Heroes and Jewels!